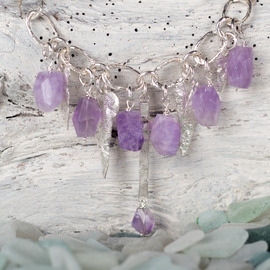 Staying true to the KATE ♥ CHELL distinctive organic style ‘Sparkle’ is a quirky collection of pretty charms and stones inspired by the Bohemian lifestyle of wanderers, adventurers and vagabonds searching for truth, freedom and love. 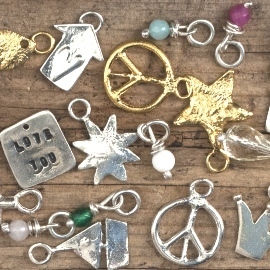 These gorgeous charms are simple but beautiful, with something for everyone and every occasion; they can be ordered individually, grouped together as a unique collection or even added to existing KATE ♥ CHELL pieces. Just find the mix that reflects your passions! 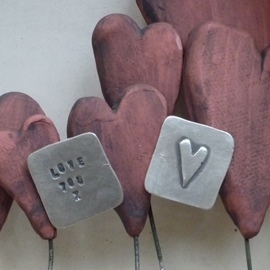 The delicate melted silver hearts symbolise friendship, family and love. A chain of hearts is longer than we can imagine; hearts that belong together, hearts that have been broken and hearts that simply need fixing. But they are always linked together somehow. 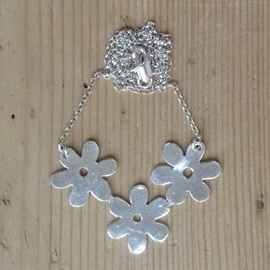 A fresh summery take on silver jewellery inspired by the simple flowers we all adore. 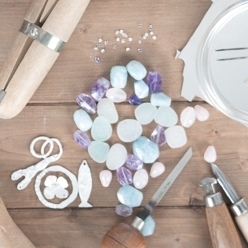 Lovingly crafted, this eye-catching collection is very pretty and is sure to be much-admired. Daisy Daisy give me your answer do! 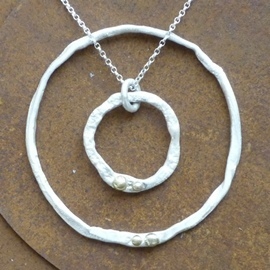 There is something about the natural organic form of the golden nuggets that sits happily with Kate’s distinctive style. Melted silver hoops, bars, a bangle and a ring are combined with 9ct solid gold nuggets to capture the romance of adventure. 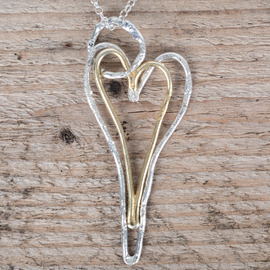 Perfect as a gift for close friends and loved ones or just as a personal keepsake. 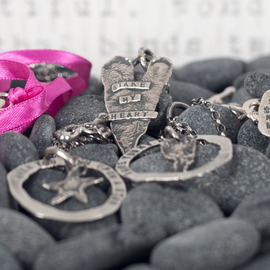 The Make a Wish collection features hammered bangles, pendants and a chunky chain bracelet with hand stamped poems, personal messages or quirky sayings. Exquisitely designed and handmade in Britain, Jewels is a collection of distinctive, contemporary pieces with Kate’s signature T-bar catch complemented with rough cut semi-precious stones to add colour and glamour. 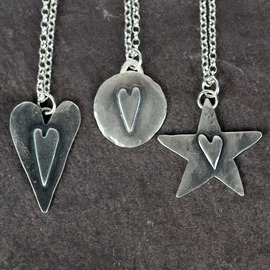 Sometimes keeping things simple is a good thing; by hammering flat silver and adorning with unfussy hearts the Black Heart collection is oxidised to create dramatic contrast. 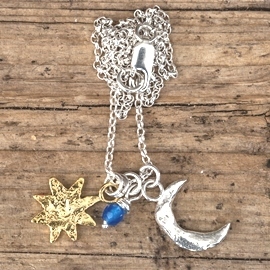 The pendants all feature Kate’s signature T-bar catch. 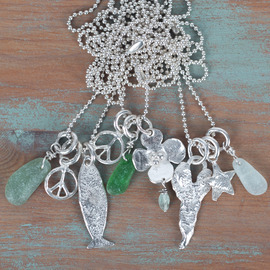 There is a little bit of a festival goer in everyone; beautifully crafted, the Peace and Love collection is adorned with charms and semi-precious stones. Very much of the moment without having to get muddy or sleep in a tent! Working predominantly in silver with gold vermeil highlights, Kate’s Silver and Gold collection adds a touch of glamour to her distinctive style. 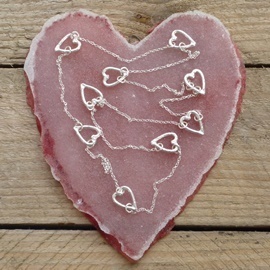 By melting and hammering silver, the simple organic designs in the Melt my Heart collection take on a unique, natural feel. 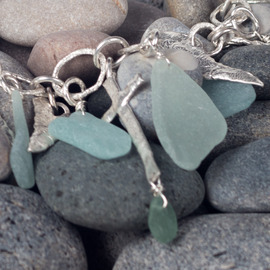 Every piece of sea glass is unique and Kate captures the romantic provenance of this beautiful natural treasure in her signature Mermaids Tears collection also with signature T-bar catch. 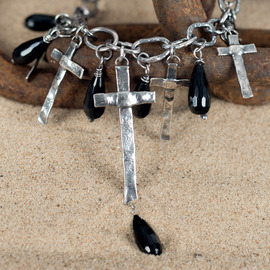 Inspired by the notorious 16th century Irish pirate, Grace O'Malley; Black Treasure is a collection of statement pieces in oxidised silver featuring melted links with signature T-bar catch and melted crosses with black onyx stones. Kate’s quirky take on occasion pieces have diamonds set in 18ct gold nuggets featuring silver and 18ct gold chain necklaces with signature T-bar catch and hammered silver rings. Distinctive, daring, glamorous. 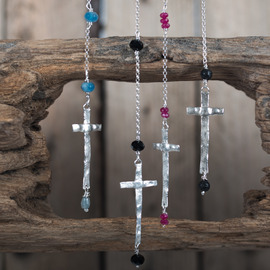 Rosary necklaces aren’t just for praying anymore and celebrities have been spotted wearing sometimes up to four pieces at a time over a slinky corset dress or vintage rock T-shirt; Kate’s Rosary collection is very much on trend. 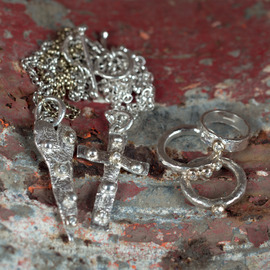 KATE ♥ CHELL jewellery for men… watch this space for an assortment of exceptional new pieces. Whether for an engagement, wedding or special occasion, Kate considers it an honour to accept commissions for bespoke pieces. 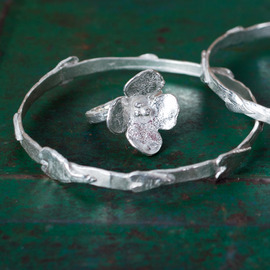 Remodelling existing jewellery is Kate’s speciality; precious stones, gold and silver are 'upcycled' to create an exquisite contemporary one-off piece.